The technology equipment in AC N223 has been temporarily assigned to this Music Department classroom from the Halsey Technology Center, Halsey 259, 424-4979. One video projector is capable of projecting both the document camera image and the computer image by switching between the computer and the document camera using the document camera controls. The document camera MUST be turned on for the signals to be sent properly. The other end of the cable from the RGB out from the document camera should be connected to the video projector RGB2 IN. This is sending any image from the document camera to the video projector. 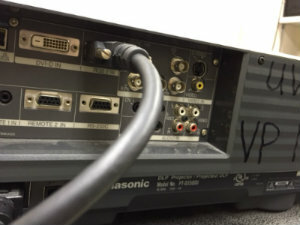 The other end of the RGB1 cable from the video projector should be connected to the VGA adapter on the back of the computer. This is sending the image from the computer into the document camera so it will go out to the video projector. (1) Pause: Pause the last image projected while placing the next item. Press Pause again to continue. (2) Iris: Adjust the brightness of the screen. Zoom Tele to gradually enlarge. Zoom Wide to gradually reduce. 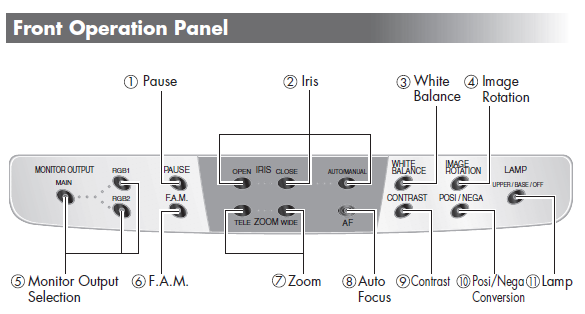 (8) Auto Focus AF: To focus automatically. (11) Lamp Lamp: To switch the lighting. Red ring around it when it is in Standby, ready to be turned on. Press so the red ring turns green. Adjust the image, locate the LENS button. The projector image is generally zoomed as large as possible. If the image is not large enough to fill the screen, move the projector cart back until it is set up appropriately. Power projector off when finished with class session. 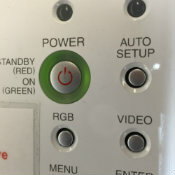 Press the Power button so the green ring turns red again. Press the power button a second time for Standby mode. Standby turns lamp off so fan can cool. Do not unplug the video projector. Make sure the document camera is turned on. Check the cables to be sure they are connected properly as indicated. 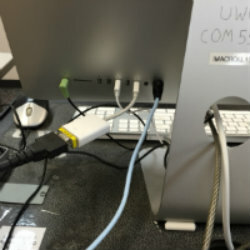 Make sure the VGA adapter out of the computer is fully inserted into the port. Make sure that RGB1 is selected on the document camera. 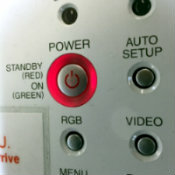 Press RGB to be sure the video projector is in the proper setting to display the computer image. RGB2 XGA60 should appear for moment in the upper right corner of the screen. Contact Halsey Technology Center at 424-4979 or contact the Help Desk at 424-3020.